What’s wrong with the dietary advice Diabetes UK dishes out to diabetics? If you’re reading this blog post on 5th March 2012, there’s a good chance you came to it as a result of listening to discussion on BBC Radio 4’s programme ‘You and Yours’ about the most appropriate diet for those suffering from diabetes. You can listen to the broadcast here (the item starts about 15 minutes into the show). The UK’s largest diabetes charity – Diabetes UK – advises diabetics to include starchy foods with every meal. I strongly object to this on the grounds that this approach is unscientific, counter-intuitive, and likely to worse blod sugar control and increase the risk of complications. I wrote this article ahead of time, because I know how challenging it can be to get all the most important facts out when time is short. This article is an attempt to get down what I believe to be the salient points, with some references to the science where relevant. 1. Type 1 diabetes: caused by a failure of the body (actually, the pancreas) to secrete insulin – the chief hormone in the body responsible for keeping blood sugar levels in check. It usually develops in childhood or early adulthood. The condition requires treatment with insulin. 2. Type 2 diabetes: here there is often a lot of insulin in the body, but the problem is the body has become somewhat unresponsive to the effects of this hormone (insulin resistance). Sometimes, type 2 diabetics can have difficulty secreting enough insulin as a result of what is sometimes termed ‘pancreatic exhaustion’. The condition generally develops in adulthood (though it’s increasingly being diagnosed in children). Treatment usually involves lifestyle modification (diet and exercise) and drugs. Some type 2 diabetics go on to require insulin. Type 2 diabetes makes up more than 90 per cent of all cases of diabetes. What’s the problem with raised levels of sugar in the bloodstream? When blood sugar levels are raised, there’s increased risk of glucose attaching to and damaging tissues. This can lead to complications such as eye disease and blindness, heart disease, kidney disease and poor circulation and nerve damage in the legs which may lead to amputation. What does Diabetes UK recommend that diabetic eat? Examples include bread, pasta, chapatis, potatoes, yam, noodles, rice and cereals. The amount of carbohydrate you eat is important to control your blood glucose levels. Especially try to include those that are more slowly absorbed (have a lower glycaemic index) as these won’t affect your blood glucose levels as much. Better choices include: pasta, basmati or easy cook rice, grainy breads such as granary, pumpernickel and rye, new potatoes, sweet potato and yam, porridge oats, All-Bran and natural muesli. The high fibre varieties of starchy foods will also help to maintain the health of your digestive system and prevent problems such as constipation. What’s the problem with this advice? Starch is made up of chains of sugar (glucose) molecules. When we eat starch we digest it down into sugar and then absorb this sugar into the bloodstream from the gut. While it’s often said that ‘complex carbohydrates’ give a ‘slow, steady’ release of sugar into the bloodstream, this is generally not the case at all. We know this from research in which the tendency for foods to disrupt blood sugar levels has been measured to derive what’s known as its ‘glycaemic index’. The GI is a quantification of the speed and extent to which a food releases sugar into the bloodstream. The higher a food’s GI, the more disruptive it is to blood sugar levels. 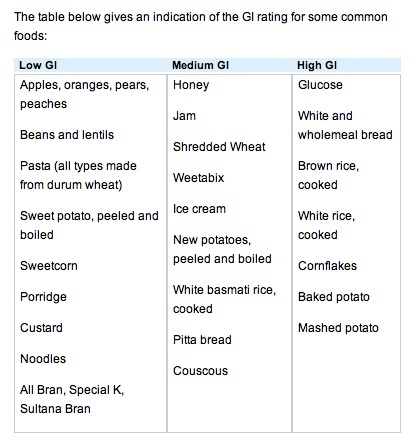 In the GI scale, pure glucose is given a value of 100, and then other foods are compared to it. Table sugar (that some people use on their cereal, add to tea or coffee and use in baking) is made of sucrose, which is half glucose and half fructose. The GI of table sugar is about 65. Just bear these things in mind when consider that boiled and mashed potato have GIs that averages about 55 and 70 respectively. Wholemeal bread has a GI that averages out at about 70. The GIs of white rice, egg noodles and porridge are about 60, 57 and 70 respectively. We can see from this that many of the foods Diabetes UK recommend for diabetics are about as disruptive for blood sugar as eating sugar itself. You can read what Diabetes UK has to say about the GI here. Diabetes UK does not define what constitutes ‘low-‘ ‘medium-‘ and ‘high-GI’. However, rather oddly, brown rice gets a ‘high’ rating, though its GI is about 45, while say Shredded Wheat is rated as ‘medium’ while its GI is 83. Over in the ‘low-GI’ column we have Special K and Sultana Bran, yet both of these cereals have GIs of about 70 (Special K’s GI varies according to country but averages out at about 70). In fact, Diabetes UK gives special mention to these named foods in its breakfast recommendations. However, including starchy (and sometimes sugary) foods such as these in the diet will likely worsen blood sugar control (compared to a diet lower or devoid of these foods), thereby increasing the need for medication and enhancing risk of complications. What might explain this misinformation and bad advice? See here for a list of corporate sponsors of Diabetes UK. In amongst a whole raft of food and diet companies, you’ll see ‘Kelloggs’ (who make Sultana Bran and Special K) and ‘Shredded Wheat’. Could this explain why there highly disruptive foods get special mention from Diabetes UK and make their way into the ‘low-GI’ category even though they are anything but? I don’t know, but we should at least ask the question, I think. Does eating less carbohydrate help control diabetes? The evidence regarding lower-carbohydrate eating in diabetes has been well reviewed . This review provided evidence that carbohydrate restriction improves blood sugar control. One study, for instance, found that a low-carbohydrate diet over 6 months allowed more than 95 per cent of type 2 diabetes to reduce or eliminate their medication entirely . It should also be pointed out that, overall, low-carbohydrate diets are significantly more effective than higher carbohydrate, lower-fat diets for weight loss (the evidence is comprehensively reviewed in my latest book Escape the Diet Trap). Low-carbohydrate eating is not a magic pill, but in practice countless individuals have found it to be highly effective for controlling blood sugar levels and improving markers for disease. I’ve known many type 2 diabetic use this approach to return to a state where tests essentially show no evidence of diabetes. So what’s wrong with low-carbohydrate diets? The usual accusation that such diets are high in fat, including ‘saturated’ fat that can cause heart disease (that diabetics are prone to). Actually, there is good evidence that when carbohydrate is cut from the diet, while the percentage of fat increases in the diet, the absolute amount of fat in the diet stays about the same (in other words, those switching to low-carb eating don’t generally eat more fat as a result) [3-6]. This issue is a moot point, because there really is no evidence that saturated fat causes heart disease anyway. There have been several recent major reviews of the evidence regarding role that saturated fat, or fat in general, has in heart disease. One such review conducted by researchers from McMaster University in Canada found that epidemiological evidence simply does not support a link between saturated fat and heart disease . Another recent study out of Oakland Research Institute in California, USA  – this one, a meta-analysis (adding together of several similar studies) found saturated fat consumption has no links with heart disease risk. Yet another comprehensive review of the relevant literature was performed as part of an ‘Expert Consultation’ held jointly by the World Health Organization (WHO) and Food and Agriculture Organization (FAO) of the US . Again, no association was found between saturated fat and heart disease. This review also included a meta-analysis of intervention studies in which the effects of low-fat diets (these usually target saturated fat specifically) were assessed. Lower fat diets were not found to reduce the risk of either heart attack or risk of death due to heart disease. The most recent review of the evidence was a 2011 meta-analysis, in which the results of 48 studies were pooled together . Each of these studies tested the effect of reducing fat and/or modifying its nature in the diet. In general, the study subjects reduced saturated fat intake and/or replaced it at least partially with so-called ‘polyunsaturated’ fats (e.g. vegetable oils). The results of this review showed that these interventions did nothing to reduce the risk death due to cardiovascular disease nor overall risk of death. In studies in which lowering and/or modification of fat was the only intervention, risk of cardiovascular events such as heart disease and stroke was not reduced either. You’ll notice that part of Diabetes UK’s justification for including sugar-disruptive foods in the diet of diabetics is the fibre they can provide. The sort of fibre that is generally being referred to here is known as ‘insoluble’ fibre – more colloquially referred to as ‘bran’ or ‘roughage’. This is said to provide bulk to our stools, and help prevent constipation and colon cancer. Actually, insoluble fibre can be irritant to the gut, and provoke symptoms such as bloating and discomfort. On the other hand, the other main form of fibre – ‘soluble’ fibre – tends to improve bowel symptoms such as constipation and abdominal discomfort . Soluble fibre is found abundantly in natural foods such as fruits, vegetables, nuts and seeds. The idea that insoluble fibre helps prevent colon cancer is not supported by the research, either. For example, studies show supplementing the diet with fibre does not reduce the risk of cancerous tumours or pre-cancerous lesions [12-14]. The authors of a recent review concluded that “…there does not seem to be much use for fiber in colorectal diseases”, adding that their desire was to “emphasize that what we have all been made to believe about fiber needs a second look. We often choose to believe a lie, as a lie repeated often enough by enough people becomes accepted as the truth” . On 2nd March I had an email from someone telling me that he’d recently been approached by people in the street asking for donations to Diabetes UK. Nothing odd about that, except that they, apparently, were using Krispy Kreme doughnuts as an inducement. His enquiries reveal that Diabetes UK sanctions this approach and discourages the elimination of any food group from the diet. What, even doughnuts? What sort of a message does using doughnuts to induce people to donate to Diabetes UK send out? Sadly, in my view, it’s a message that is consistent with the wrong-headed and potentially dangerous dietary advice that this charity dishes out generally. 86 Responses to What’s wrong with the dietary advice Diabetes UK dishes out to diabetics? You are exactly right, I cant understand why diabetes UK and the NHS need to cling onto the starchy carbs mantra. What’s wrong with ketosis? exactly you nailed her on that point. If you need carbs which you quite rightly said you dont you can get them from fibrous veg, like broccoli, cabbage sprouts and cauliflower. keep up the fight and we can make a difference to the info that is given. Yes, spot on! I can’t believe how much ‘official’ misinformation there is, not only on the Diabetics site, but the NHS Eatwell Plate, and much of what my daughter was taught in Food Technology at school was wrong in light of the research that you discuss in your book. Do you have a pack of information that could be sent to schools, to the food technology departments (and the examination boards and curricula setters) and to inform their school dinners? Anything to change people’s understanding.. Very best wishes, and thank you for such a brilliant book. Very interesting discussion on Radio 4 today – just shows how the standard of teaching of human biology and nutrition in schools needs improving. I suspect many people do not realise digestion causes carbohydrates to be broken down to glucose. I was diagnosed with type 1/ type 1 equivalent (insulin dependent) aged 40 and have been astonished by a lot of NHS/ diabetes institutional advice on carbohydrate ‘use’. The first management method I introduced was to reduce significantly the amount of starchy carbohydrates I consume (at least on an every day basis), as this clearly allows me far better blood glucose control. Energy levels are better with this approach than where I consume tiredness inducing carb rich meals, so I do not accept Diabetes UK’s widely stated pronouncements that starchy carbohydrates are vital for energy. Nor do I understand why Diabetes UK would say (today on radio 4) that low carbs would lead to a risk of hypoglycemia for type one diabetics; I deliberately keep carb consumption low, as it is easier to gauge accurately the correct insulin dosage and therefore to reduce the risk of over administration of insulin – i.e. lower carbohydrate intake equals less risk of hypos, not more. Well done for highlighting this issue – I hope the message gets through, as people’s health and the public purse are clearly at issue considering potential complications of under-controlled blood glucose levels over time. Dr Briffa, would you then advise somebody with type 2 diabetes to cut out carbohydrates ( i mean starchy foods) all at once, or gradually? I’m asking this as i have a friend with type 2 diabetes – his doctor has not advised him to cut out starchy foods, and i’m worried in case there are any risks in doing so. I missed the programme unfortunately, and it’s a real shame because there isn’t a Listen Again facility for this programme. I don’t understand why there appears to be no legal remedy to prohibit/punish the charities and other agencies that dish out the harmful dietary advice they do. And surely it is a form of corporate/criminal fraud to elicit donations from the public and others, when the donations will help to perpetuate the damaging propaganda that swells the profits of junkfood manufacturers. Thanks for that helpful information, Jean. I was listening to the You & Yours programme this morning in the car and actually pulled over to concentrate on everything that was being said. It seems to me that Diabetes UK have adopted an entrenched position, based on the opinion of their own experts, that they feel obliged to defend, yet both parties were quoting ‘the evidence’. I wanted to hear the Diabetes UK lady say they would bring you onto their panel of medical advisers and between you you can arrive at a SINGLE OPINION based on the SAME EVIDENCE. Surely the fact that you are expressing such a convincing alternative view would make Diabetes UK want to drill down into the detail of what you are saying and either 1) change their minds or 2) convince you their way is the way to go? Indulging in a short, on-air slanging match did not do the charity justice. I just re-read your article John. Are Diabetes UK a charity or are they a government department? It stinks that the big food companies get to manipulate the information that is given to the public especially when it is harming patients and the health of the nation. A close friend of mine is a GP and trots out this same information about carbs and diabetes. I think this is a bigger public health campaign than the anti-smoking lobby is/was, what are your plans are you in it for the long haul? First off, your body can run on either carbohydrates or fat for its primary fuel. Except for high-intensity efforts (like weightlifting or marathoning), bodies don’t need carbs for fuel; ketones from animal fats do just as well. Second, low-carb doesn’t mean *no*-carb. To prepare for a weightlifting workout, I eat a bowl of chili with beans the night before. The carbs in the beans restore my glycogen, which can be used for fuel quickly enough to support a full, intense workout. The medical literature is full of studies that show a low-carb diet is an excellent strategy for reducing insulin spikes and controlling diabetic symptoms. Unfortunately, most doctors are in the vise grip of old mythologies enforced by threat of censure by the NHS. If you go to http://www.bbc.co.uk/radio4 and choose the alphabetical programme finder option you can access the You and Yours site and listen again. Diabetic friends of mine have been told to cut the sugar but have not been advised that carbohydrate can also raise blood sugar. They seem to believe that carbohydrate is different to sugar and look at me blankly when I tell them that ultimately it is the same. As a 48 year old type 1 diabetic of 36 years, I cannot agree more with you John. I spend every day trying to keep my blood sugar stable and it became clear to me many years ago that the best method was by minimising my carbohydrate intake which would keep my insulin requirements low too. I believe that a low carb diet should be recommended not just for diabetics, but for everyone. The western diet is filled with carbohydrates which started when we first became farmers and our bodies have not been able to adapt in this relatively short time. We are designed for mostly meat eating with the addition of a few berries, nuts and leafy vegetables and the odd root. Even fruit has been developed to be as juicy as sweet as we can make it and fruit has the same capacity to raise my blood sugar as chocolate and similarly quickly. As a result, I have not eaten any fruit for years. Currently, I have no weight or health problems of any sort. Keep spreading the low carb message! Thank you so much for what you are saying. I went onto the Diabetes UK / NHS starchy carbohydrate diet when diagnosed pre-diabetic. Within a year I was full blown T2. Changing to a low to moderate carb diet has now got my blood sugars back to nearly those of a non diabetic person within 3 months and I’ve lost over two stone in weight. I know I’m not cured as I cannot eat a normal amount of carbs but I feel great and back in control of my life for the first time in over two years. This isn’t rocket science! Other countries like Sweden would recommend a low to moderate carb diet to begin with. Seems to be Diabetes UK and the NHS is just stuck in 40 year old dogma rather than using research done in the 21st century. Please keep up the good work for all our sakes. As a 48 year old type 1 diabetic of 36 years, I cannot agree more with you John. It became clear to me many years ago that the best method was by minimising my carbohydrate intake which would keep my insulin requirements low too. I believe that a low carb diet should be recommended not just for diabetics, but for everyone. The western diet is filled with carbohydrates which started when we first became farmers and our bodies have not been able to adapt in this relatively short time. We are designed for mostly meat eating with the addition of a few berries, nuts and leafy vegetables and the odd root. Currently, I have no weight or health problems of any sort. Keep spreading the low carb message! As a 48 year old type 1 diabetic of 36 years, I cannot agree more with you John. It became clear to me many years ago that the best method was by minimising my carbohydrate intake which would keep my insulin requirements low too. I believe that a low carb diet should be recommended not just for diabetics, but for everyone. The western diet is filled with carbohydrates which started when we first became farmers and our bodies have not been able to adapt in this relatively short time. We are designed for mostly meat eating with the addition of a few berries, nuts and leafy vegetables and the odd root. Even fruit has been developed to be as sweet as it can be and as a result, it has the capacity to raise my blood sugar as quickly as chocolate so I simply don’t eat it. I am not convinced by the GI scale either. I find that any carbohydrate will raise my blood sugar rapidly irrespective of what type of carbohydrate it is. Currently, I have no weight or health problems of any sort. Keep spreading the low carb message! I’ve had Type 2 diabetes for 23 years and remember being surprised that received wisdom on diet for diabetes had changed so profoundly from high protein/high fat to complex carbohydrate-based. I was not impressed by the Diabetes UK speaker who didn’t seem to know the difference between hypo- and hyperglycaemia. Another product that Diabetes UK has been pushing is Splenda, which I suspect of pushing my blood sugar levels UP. It’s about time they re-examined their diet advice, meanwhile I’ll buy your book! I have yet to hear the piece, although the attitude you describe does not surprise me. I had my diabetic review this morning with an enlightened Diabetes specialist who is actively working to changed the ‘high carb’ advice that is prevalent in the NHS. I am a low-carbing type 2 who has knocked 3 points of his hba1c in just 6 weeks and lost plenty of weight in to the bargain. The advice being given by many health care professionals is damaging the health and outlooks for thousands of type 2 diabetics. Wow! – how great to hear a British doctor speaking out so eloquently on this issue. I have type 1 diabetes and have been been ‘experimenting’ with the suggested diet advice of Dr Gabriel Cousens and Robert O Young, both of whom appear to have enabled life changing benefits for diabetics – with low carb diets. Thankyou, hearing you in the middle of my usual day has meant a lot! Great contribution, John. I challenged DUK last year on this subject and got a similar response to the broadcast, although the person who replied did admit that Carb portion control was important. I’ve had T2 for 8 years and I am on max tablets. The only way I am able to delay insulin is to keep my carbs under great control. My meter tells me their effect. The http://www.diabetes.co.uk/diabetes-forum/ website has an ongoing unbiased discussion on the subject and the experience of most contributors is that carbs are a big problem. Sadly it much easier for DUK and others to listen to the might of the vested interests of the food companies than the experience of many 1000s of actual sufferers. I haven’t read the book yet but caught the discussion on R4. I am interested in the implications of this for a non-diabetic. Everything I was taught re. food and exercise is that carbs are essential to fuel output. How do I prepare for e.g. a 20 mile hike without carbs? I think I’d expire. Surely there is not a 1 size fits all approach even when it comes to diabetes? Shouldn’t carb intake relate to output levels? Look at the piles of pasta consumed by athletes – and they have the best nutritional advice available. Carbs can’t be all bad surely? Athletes have nutritionists brought up on conventional wisdom and that isn’t always the best! Anyone notice that Andy Murray has changed his diet recently? It seems to have improved his tennis too…. thank you for voicing this, i couldn’t agree more. type 1 for 18 years. cut out all grains over a year ago and never felt better. Last year I met a very large lady in a wheelchair with her lower leg amputated and still suffering from further complications of her Type 1 diabetes. Her blood sugar was 25 ie 5 times higher than mine and several times a healthy level. I was appalled to see her eating chips and starch coated fish along with a cup of sugary tea, she was eating herself into the grave following the advice of clowns like Diabetes UK. I have just posted this on the Diabetes UK facebook. 12 minutes in – the dangers of a high carbohydrate as recommended by Diabetes UK. 4 years ago I was developing crippling neuropathy – having followed the D uk recommended diet for 7 years. Following advice on the internet I cut out all the obvious carbs. In 3 months I was well again, out of pain & other conditions improved. 4 years on (at 73) I am still well – & preparing for an evening flood-lit tennis. @Anna – do some research on polar exploration and other feats of endurance and exertion – you’ll probably find the 9 calories per gram of fat were more important to them than the 4 calories per gram of carbs – especially when they had to carry their own food. Fact is our bodies carry way more reserves of energy as fat than as carbs. Interesting stuff. 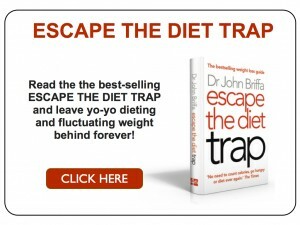 I also recently enjoyed reading Escape the Diet Trap. In both this article the book you cite the Skeaff et al. study – please note the FAO is a UN body, not a US department. Did you see last week’s BBC Horizon programme ‘The truth about exercise’ (http://www.bbc.co.uk/programmes/b01cywtq)? I’m curious to know what you make of the dietary elements covered, especially the parts about fat in the blood stream. Am I right in thinking that you’d argue this is irrelevant to weight gain as it says nothing about the fixing of fat into fat cells? What about the health impacts of fatty deposits forming on the wall of the blood vessels? Thanks for opening my mind to these issues. Mr King. Did you notice that the fatty breakfast that the presenter ate on the Horizon program included bread, sausages, baked beans and cappuccino ? The beans and cappuccino probably had a fair bit of sugar in them and the sausage probably contained rusk. If it had been more scientific the breakfast should have been just egg and bacon perhaps. Hi John. I’ve just listened to the Radio 4 piece. I almost felt sorry for the Diabetes UK representative. She was struggling to defend the indefensible. When Lizi and I started our company in 2003 to make low glycaemic foods, we contacted Diabetes UK to see if they would be interested in running a feature on what we were trying to do. We’d taken the decision to measure the glycaemic load of all of the products we make, and they were all formulated with a low GL to have a minimal effect on blood sugar. We were told that they couldn’t possibly feature our products because they were too high in fat! I would thoroughly recommend a book by Gary Taubes called “Why we get fat……and what to do about it”. Whilst the book goes into scientific detail about the way the body manages the food given to it, it does so in a clear easily readable way. It also recounts the history of dietary advice and the great deal of research that has been carried out over the past 2 hundred years and also how we have arrived at the low fat methodology that dominates modern thinking. Gary Taubes gives a logical argument, substantiated by research evidence which clearly demonstrates the link between weight gain and insulin. Insulin is only produced when the body needs to keep blood sugar levels in check and blood sugar elevations are primarily caused by carbohydrate intake. On the ‘You and Yours’ programme, Deepa from Diabetes UK states that increase in hypoglycemia results from low carb diets. I would question this based on my personal experience. A low carb diet (not more than 80g a day) has stabilised my blood sugar. I have no more hypos than I did on the Diabetes UK diet but the key point, to me, is that any hypos I are less rapid and less severe now that I’m on a low carb diet. Another benefit of my lower carb diet is that my hypo awareness has become noticeably improved as a result. My HbA1c has become a lot better on the low carb diet, as you’d expect, as well. No more brain fog each day, thank heavens. Entirely enlightening. Thank you. Having listened to the radio four discussion I couldnt wait to discuss this with my wife. Have been T1 for 15 years now and battling with blood sugar control. I am now questionning how much of this battle has been down to misinformation from NHS/Diabetes UK etc. The most recent advice I have received was to eat as many carbohydrates as you like and in what ever form and here is the Carbohydrate Counting Course we will send you on so you can count all those carbs! Time to change. I have just managed to catch up on the You and Yours segment on Radio 4 and fully agree with your remarks Dr Briffa – very eloquently presented. The dietician’s response was so hesitant it almost had me squirming in my seat. I’m a degree qualified Nutritional Therapist and have been using a low carb dietary approach for many years advising a protein, non starchy veg based diet with managed input of starchy carbs to clients. I’m also a great fan of the work of Dr Bernstein. The proof is in the results we get. Many clients we see are pre-diabetic, overweight, already on medication. Once following a low carb approach we see their blood markers normalise and they lose weight (or I should say fat) and this happens quite quickly. Please continue the fight, it needs someone from mainstream medicine to get the message across and be heard. I’m a very low carb T2 diabetic 10 years diagnosed and using only minimal medication, having avoided the”inevitable” progression of the condition. My Hba1c has been consistently in the 5% [non-diabetic] range for most of the last 7 years. I walk miles each week and have never sufferes fromnot having eaten carbs. We need MORE people to argue the low carb view point. In T1 carbohydrate merely “feeds” the insulin and leads to weight gain. Very well said. I completely agree that the dietary advice from Diabetes UK and sometimes from the NHS is misleading and unhelpful. It also happens in the USA – I was there when I was diagnosed. I have type 1 diabetes and I have managed to reduce my average blood sugar levels to healthy levels (HbA1c mostly less than 6.5%) through my own research and efforts and adopting a healthy lifestyle with a low carb, high vegetable diet., not from following the dietary advice of the NHS or Diabetes UK! I was particularly shocked when the Diabetes UK dietician stated that one reason they advocate eating starchy carbohydrates was to avoid hypos “which could lead to diabetes complications”. She seemed to be unaware that hypos are due to the drugs, not the food! If you reduce the carbs, people with type 1, or type 2 and taking insulin, will reduce the insulin they take for their food, in direct proportion for the rapid acting or bolus part. People with type 2 could reduce the amount of drugs they’re taking, which would be a benefit – less side effects, in consultation with their doctor. It would be great if more doctors would actively promote this and in my view, it should be part of their duty of care. By reducing the amount of carbs we eat and insulin we need, we reduce the amount of error that can lead to hypos, and any hypos we do have are less severe. Dr. Richard Bernstein calls this ‘the law of small numbers’. I do think it’s also important to eat an alkaline diet with more vegetables, ideally 80%+ alkaline-forming foods, and not just swap starchy carbs for more meat, as per the work of Dr Robert Young and more raw food, also ideally 80%+ as per Dr Gabriel Cousens. They and their work have both helped people with type 2 to reverse their diabetes and a few people with type 1 to get off insulin and even produce some of their own insulin again! I have just received my Balance magazine from DUK. It has a double page spread about diet. It continues to support high carbs i.e. ” Have 7-14 portions per day. One -third of your diet should be made up of these foods, so you should include them in all meals. What’s a portion? One portion is equal to 2-4 tbsp cereal, 1 slice of bread, etc etc. Now a slice of bread can be 12 gm so they are suggesting up to the equivalent of 14 slices of bread per day? This is madness. Then I look at the recipe section with recipies containing added sugar and honey. In the same magazine we have a campaign about amputations; I sense a disconnect within DUK…. Don’t forget you SHOULD eat up to 42 tablespoons of mashed potato. Why do DUK call their magazine “Balance” ? A reference to balanced diet per chance. I heard the program the other day and I thought at last someone has picked up on this! As a personal trainer I recommend people not to eat starchy carbs, especially if they are looking to lose weight. I often wondered why the diabetes advice always swayed towards eating starchy carbs. It makes no sense. I was really intereted to hear your views and it helped clarify my own thoughts on the matter. I despair that DUK are still giving this advice. As a T2 Diabetic for 3 years now, I’ve tried most eating patterns to both lose weight and lower my blood sugar. NOTHING does this as effectively as cutting back on the carbs I eat. I don’t eat what purists would consider a low-carb diet, but then it isn’t a diet for me. It’s a way of life. Permanently. If you think about what Diabetes actually is, it isn’t that surprising really. What we have is an impaired ability to convert ‘sugar’ i.e. carbs into energy. (Incidentally, that’s why Diabetics get fat, as excess sugar turns into blubber). This seems blindingly obvious to me, so I don’t get why DUK doesn’t get it either. I used to be a moderator for the iVillage “Fat Flush Plan” message board. The Fat Flush Plan is very similar to your eating guidelines. When diabetics started eating the FF way they very soon came off their meds, or vastly reduced them. I heard the radio programme, and I was shouting at the radio. That lady from the Diabetes charity just hadn’t a clue!!!! “using doughnuts to induce people to donate to Diabetes UK”! That’s like using cigarettes to induce people to donate to Cancer Research! When I started out as a carer over 14 years ago, one of our clients was a Type 1 diabetic. The advice for his diet contained a directive that he should only eat a limited amount of carbs and these had to be weighed to ensure he got his allowance and no more. What has changed so radically since then that DUK is dispensing such rash advice? Some years later I read that the view on treating Type 1s had changed and that instead of getting them to restrict their dietary intake, they were being reviewed and their insulin changed to reflect their diet as this would give them more flexibility. By this I presume it was meant that those who couldn’t keep off the carbs would have their insulin upped to reduce the imbalance. Hardly satisfactory or sensible, never mind the increased cost. All I can say is that I have had type 1 diabetes since 2004 and was advised by the hospital to eat around 1600 calories a day (even though I was extremely under weight) and to eat carbs with every meal. I was on 6 injections a day and my blood glucose was out of control. I then got the insulin pump 2 years ago, which proved to be a lot better. I must add that I’m also a keen runner, so spend a lot of my energy. 1 month ago I bought Dr Briffa’s book ‘Escape the diet trap’, not for me but for my husband who was complaining he couldn’t lose weight around his tummy. I then got interested in his comments about carbs and diabetes so decided to give it a go. I have reduced my basal and my bolus insulin by 1/3, my glucose levels are excellent( between 4&7), my energy levels have shot up. My blood tests show that my triglycerides are very good. As for my husband, he has lost inches around his tummy and says he’s never feels bloated anymore. 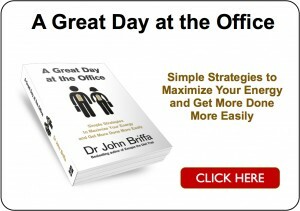 I say speak as you find and I’ve found Dr Briffa’s advice and absolute god send. Thank goodness for Dr Briffa – sometimes – sadly – his seems like a lone voice in the wilderness! Good to know there are people out there who have a sound research base and who care about our good health. Thank you Dr Briffa. Can you do your usual hatchet job on this please? Keep on the work, keep following the money! Dr Briffa..read your book 3 weeks ago and it all makes perfect sense to me! I have been able to half my insulin dosage and feel like a new person! My husband(non diabetic) also feels so much better on this way of eating. It is a crime that Diabetes.uk is ignoring your expert advice and I believe they are digging a big hole for themselves which is going to keep growing unless they wake up! Worse than having diabetes is that actually most of us are doing the opposite of what we should be in regards to eating and this will in turn put most of us on more medication, put more of a burden on the health service and will kill us before we are ready to go! Please keep up the good work Dr Briffa! I am certainly tellling everyone I know, diabetic or not! john, you’ve clearly exposed a blatant sham, and the appropriate people deserve to be severely punished. it’s really obvious there is serious corruption and financial bias involved too, not just ignorance. i suggest we figure out a way to give the CEOs of both Diabetes UK and Kellogg’s diabetes type 2, and then force them to go on their own suggested diets. that’ll be getting even real good! on second thought, we probably don’t even have to figure out how to give them diabetes type 2 – their ridiculous diet will do it for us. Thanks for a great article. I have a background as clinical dietician and Master of Public Health and supported the idea about lots of carbs in the diet for a long time. I am in the postion now at 38, that I have developed some sort of diabetes, mayby type 2, mayby some sort of MODY. I am convinced that my high intake of CARBS has led to this earlier than later, giving me high postmeal bloodsugars for many years which now has resulted in betacell failure and diabetes. I can control my blodsugar by eating about 80 grams of Carbs a day. The brain function is working – I think My question is about carbs and exercise. I feel, that high intensity is really hard to do, since my muscles are probably not getting much carbs to metabolize during the session. I eat about 100-120 grams of protein and I guees some of that is being used for glucose. Do you have any advice regarding this? Thanks in advance. I must say, it has been a reel challenge to change many of my previously ideas about healthy eating. I can now see for my self, how the standard dietetic advice is just not working! thank for you interest in this field and helping to push for more sound advice! @doctormike – in the Diabetes UK “rebuttal” I like this bit best “Other reported side effects include headaches, lack of concentration and constipation.” – as opposed to blindness, ulcers, limb loss…. jeeez! This is excellent John, and so enlightening to hear the interview! It is organisations like this that need a good shake-up, and as you quite rightly point out, soluble fibre can be an irritant to the gut. This roughage Diabetes UK recommend is far too aggressive and abrasive for the gut to cope with. If we are to look at these ‘experts’ for guidance, they should be more informed about the Glycaemic Index and the dangers of carbohydrates breaking down into sugar. It is no surprise then, that diabetes is epidemic! I can’t help but laugh, i really can’t. If i raised my eyebrows any higher i wouldn’t have to worry about my receding hairline! As a PT i do a lot of research to make sure i benefit my clients to the best of my ability. Obviously in this research one naturally gravitates to a particular “style” if you will, but hopefully without excluding all other sources of information. Although i don’t slavishly follow Dr.B, as i have a couple of issues regarding his stance on water consumption and exercise, I do endorse the majority of his views on diet. Equally, i have now learned to adopt a “follow the money” mantra, as well as adopting a macro-perspective on any so called advice that is given out regarding health and fitness. I’m by no means an anti-carb zealot; come on- a tiger loaf covered in philly, or hovis seeded sensations toasted covered in butter? Nom Nom Nom! I enjoy a rare pizza even. But 80/20, eat quality, cook properly and get off my arse? Well, you should see me now compared to what i was–and i teach this approach to my clients! I just give them better eyes to look with, and take them off autopilot, point them at websites like this and tell them to question, question, question. My eyebrows have resumed normal service. @ jimhealthy. Thanks for your input. Nope, no statins for me. My lipids have never been better, since I am on a low carb, but also low saturated fat diet. – I am aware of the different opinions regarding this. I eat lots of n3 and n9 to optimize my lipids, but also to make sure to keep inflammation to a minimum,since n-6 is proinflammatory. My doctors claim they have never seen a case like me. :-)Thats only because they simple j dont understand, how a patient can have high OGTT blodsugars and is still able to keep HgB1aC in the normal range. I actually feel pressure to “relax” and accept high postmeal bs, eventhough I have already developed a small fiber neuropathy, which was what led me to messure my bloodsugars in the first place. Cant say enough how people really have to take this in to their own hands. I am just glad I have the background as a dietetician which has made the whole process a lot easier. Brilliant advice yet again ……….the whole world’s health is at stake you only need to look at how sick huge sections of the population have become following the LOW FAT fad diet!!!! yes it is a fad whose promotion through fear based advertising has reaped trillions of dollars for the illness industry and certain sections of the agriculture sector and even this pales into insignificance when you look at how much money is being made by big Pharma selling their drugs to a fear ridden population who are desperately trying to be well but will never be if they follow the advice of the “authorities”. QUESTION EVERYTHING …………RESEARCH FOR YOURSELVES ……..MAKE YOUR DOCTORS WORK WITH YOU. NOT DICTATE FEAR BASED DRUG COMPANY PROPAGANDA MASQUERADING AS CARE FOR YOUR HEALTH AT YOU LIKE YOU ARE AN IMBECILE THAT CANT READ AND THINK FOR YOURSELF!!!!!!!!!!!!!!!! THANK YOU DOCTOR BRIFFA ………MEDICAL PEOPLE LIKE YOURSELF ARE WORTH THEIR WEIGHT IN GOLD …………even if you don’t always get it right at least your mind is open to explore issues until you find something that works!!! This has been been such an interesting week or so for your blog, and having been a low carb eater for so long, I am thrilled that at long last you might be being heard by “people higher up the chain” who just might have some influence on the appalling diet and dietary advice so prevalent in parts of the western world; however the “follow the money” worry tends to dampen my hope! But do keep in for the long haul John. There was an extensive meta-analysis in BMJ a couple months ago that showed low intake of fiber being linked to colon cancer in prospective cohort trials. A very recent systematic review in Diabetes Care stated that there is some evidence that low carb diets may have many metabolic advantages while affecting negatively on LDL cholesterol levels. Swedish dietary guidelines for diabetes (2011) fully endorse the use of moderately low carb diet as an alternative for low fat, mediterranean or low GI diet. Thanks Dr Briffa, for another wonderful exposition on the best way to deal with Type 2. I was fortunate enough to be selected by Dr Mark Hyman as one of 500 people in a beta group chosen to implement his Blood Sugar Solution — out of 10,000 applicants. Anyway, even though I only adopted a “Partial” BSS, the results were dramatic — far lower FBSs, lower weight, lower HbA1C, lower LDL, dropped one of two drugs, disappearance of two chronic physical conditions. Please continue your valuable mission! Superb as always Dr B! Thank you for all the amazing work that you are doing to raise awareness of this horrific scam. Will be covering this in The Complementary Medical Association’s monthly e-newsletter out shortly. Like you I find the advice given out by Diabetes uk (exactly the same as NHS choices website) is not the best. I have had type 1 diabetes for 40+ years and still remember the days when I ate what I wanted and stayed comfortably thin. This was before I was diagnosed and started on insulin at age 9. In the bad old days it was one injection a day and fingers crossed that it worked, no blood tests then to monitor and the strict advice to eat carbohydrate with every meal AND between meals as well. I always had biscuits in my school bag. Although very active I felt like my whole metabolism had changed and have struggled to keep my weight in check ever since. In my fifties and on a very (what I thought was a) healthy diet my weight just kept creeping up. Apple shape with BMI >26, eating all the healthy foods recommended low fat etc and brisk walking at least an hour a day (dog does not allow otherwise). After years of conditioning I was very wary of a low carb diet but started about 8 months ago reducing from >300g CHO a day (including fruit and veg) to <100g. It has certainly worked, now my BMI< 22 and weight sustained easily. What I do not understand is that after an initial lowering of my insulin dose it seems now that I am back on my old doses although I am not eating the carbs. I have to inject more insulin just to keep my blood sugar in line but this is not causing weight gain. I have not changed my protein intake (fish & pulses mainly) and have only increased fat slightly – it is a hard habit to crack after so many years. I am reading your book which only seems to refer to type 2 diabetics, but the logic of insulin levels being the direct cause of weight gain does not seem to hold with me and I am in the unusual position of knowing exactly how much insulin I have every day. David B – Insulin facilitates the gaining of weight. It is only produced when the body needs to keep blood sugar levels in check and blood sugars rise on when you consume any kind of carbohydrate. The insulin allows the body to store fat. When I became type 1 diabetic at age 12, I suffered the usual chronic symptoms of raging thirst and massive weight loss as your body starts to use your fat stores for fuel since it cannot use the sugar in your blood without the presence of insulin. The result is that you get progressively thinner (by this stage your body has stopped producing insulin and therefore cannot gain weight). So it is clear that despite the effiicacity of low carb diets, the message is still not reaching many professionals who seem anchored to the past 40 years of popular belief despite the fact that they are struggling to get results from low fat high or moderately high carb diets. I feel like we are all members of a secret club who know what is right not just for diabetics but for the general population but how to spread the message more effectively than word of mouth ? As far as I am concerned, I think children should be taught the low carb message from an early age so that the ethos can be implanted in the hope that we can start to stem the flow of obese type 2 potentials in the future. Though that would involve government and I fear that government have too many powerful businesses to appease. DAFNE can be followed on a low carb diet – it seems – quite worryingly – that Prof Sanders has somehow missed this rather obvious point. Sure – hypos are dangerous but so too is hyperglycaemia. First we need to educate the specialists and the diabetes nurses so that they gain an understanding of how all this stuff works – and eventually it will filter down to the patients. And yes, Julian King – I think you are a member of a rather secret club. There seem to be very few diabetics (Types 1&2) with a real understanding of what they need to do to manage this condition. On a happier note – my mum who is now 72 and was diagnosed with Type1 back in the 1970s and has followed a low carb diet pretty much since then. She pioneered DAFNE (despite the dire warnings of impending death from her consultants) – she’s a very brave and intelligent woman – who worked out for herself exactly what she needed to do to stay well. She just followed the logic. She remains unbelievably well – and is free of the complications that one ‘should’ see in a Type 1 diabetic diagnosed as long ago as the 1970s. I totally agree with this. Last year I read three books that totally changed the way I understood food and how it affects weight and health. As a by-product I am now two stones lighter than I have been for most of my adult life and feel healthier and more energetic aged 43 than I ever did in my 20′s and 30′s. 1, Why we get fat and what to do about it by Gary Taubes, 2. The New High Protein Diet Dr Charles Clark and 3. Wheat Belly by William Davis. These three publications let me see for myself the total and utter sham that poor people around the world are being duped by. Even the UK obesity forum website suggests eating 8 portions of carbohydrates to only two of protein. As the author of Whet Belly states – “telling diabetics to control their condition by eating more of the food that probably caused it in the first place is like telling someone with credit card debt that the only way to get rid of the debt is to spend more on the card” Lunacy, and as has been said already another case of big industry getting their mucky fingered lobbyists to excert power in the corridors of government. We know of BIG TOBACCO, BIG PHARMA Now meet BIG FOOD who are keeping us all so ovreweight and ill so that their friends in BIG PHARMA can keep selling billionsm of dollars of drugs that help to control conditions that the food caused in the first place. What a screwed up society. Thank you Dr Briffa for an excellent post and a very interesting contribution on Radio 4. It was very disturbing to hear what sort of advice is being given although I never cease to be amazed by what my patients tell me – recently I have had a newly diagnosed Type 2 diabetic patient who had been told by the Diabetes Nurse at his GP surgery to start his day with a couple of digestive biscuits (perhaps one of the well known biscuit brands are also sponsoring Diabetes UK?). I am sure that your work will help enormously to get the correct message out there. It’s unbelievable, outrageous really, that Diabetes UK is still giving out this completely wrong advice. I’m sure the damage they’re doing outweighs all the good they might do in other ways. Even the American Diabetes Association isn’t this bad. They used to say “make starches the star” of a diabetes diet. Now they encourage more protein and unsaturated fats, but still don’t say low-carb. There’s no excuse for Diabetes UK doing this. Thanks for calling them out. Hi David Spero. I’d also noticed that the ADA has changed it’s advice over the last year; there’s hope! I live in Australia and I was diagnosed with Type 1 Diabetes in December. I am 36 years old. I went to a Chinese Herbalist and did acupuncture and watched what I ate. I was on insulin for 5 weeks and I would contact the Diabetes Educators and tell them my reading was 5.2 and I was going to eat a chicken salad so if I put in my insulin I would have a hypo. They advised me to still put the insulin in but make sure I ate enough carbs to cover the insulin injection. I spoke to my doctor and she couldn’t believe that they were forcing me to eat carbs. It has been 8 weeks now that I haven’t used any insulin injections. I don’t eat any sugars or sweets and I make sure I watch my carb intake. At my hospital checkup I showed the doctor my booklet and they couldn’t believe I wasn’t taking any insulin injections. I told them I was watching what I was eating and exercising and they responded that this wouldn’t make a difference! Again my doctor was shocked with the statement. If I eat carbs and don’t excercise and burn it off then my readings are slightly high! The believe that the Diabetes Educators need to be re-educated and move with the times. How many other people who have been diaganosed with Diabeties could prevent themselves from injections like I have. At least I know that my pancreas needs some attention and I can’t overstress it with unneccessary foods. I wonder how many other people have used alternative medicines and watched their diets in order to reverse diabetes, no matter how long it is for. I am grateful of this second chance and I hope others can have this chance too! Thanks for your comments and the link but I think you may have misread my post..I said I have managed to half my insulin intake by reducing my carb intake not stop my insulin. I am a type 1 diabetic. I have managed to reduce my background insulin from 10 units to about 6 morning and bedtime and fast acting from 6 to 2 or 3 at lunch and teatime so am so pleased with that. Indeed if I stopped completely I would be in big trouble as you say!